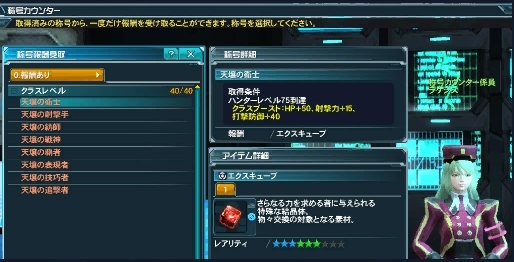 PSO2 gets its second Challenge Quest with this update, along with Class Boost title rewards! Enter the secret phrase from the latest live broadcast before maintenance to receive prizes at a later date! Xie and her 3rd Anniversary Exchange Shop are leaving the game with this maintenance, so spend those badges! The development team is currently aware of an issue that prevents the game from starting up, and causes long loading times in various places. They recommend users with [Microsoft Security Essentials] or [Windows Defender] to exclude the PSO2 installation folder from Real-Time Protection. 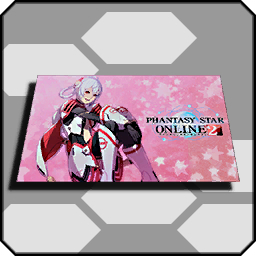 The Sweets Paradise collaboration is serving up some new treats for PSO2 with its second set of items, available in-game after maintenance. Check the tab in last week’s maintenance post for more details. Reaching level 75 in a particular class will unlock a Title Reward that boosts certain stats. Each class’s Title Rewards can be redeemed at the Title Counter. Each stat boosting effect will apply to ALL the characters on your account. You can find these Class Boosts in the “Class Level” subcategory in the Title Counter. Typically the description of these Titles lists the stats in yellow text. PA Customizations are now included in Daily Crafts! Veteran Crafters: The 15th & 31st of every month. PA Customizers Only: The 30th of every month. Players can earn extra miles by playing the quest targeted for a Challenge Mile boost. The challenge quest that receives this boost will be listed here and on the official site. In celebration of its release, the 2nd challenge quest will receive an extra +50% boost on top of its initial boost week bonus. 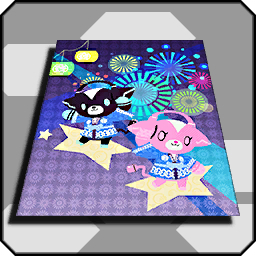 Therefore, Challenge Quest #2 receives a +100% CM Boost from August 26th ~ September 1st @ 23:59 JST. 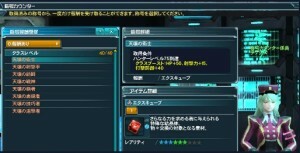 You can unlock hidden potential abilities on certain ★7 and ★12 weapons by using Photon Boosters. This item is available at the Challenge Mile Exchange Shop! Changed the contents of the rewards. Changed the reward system so that each stamp contains an item. Changed the total number of rewards on a stamp card to 30. Changed the design of the stamp card. Made the system notify you of the next login stamp item you can retrieve. “Liliparium All” reduces the cool down times of all unlocked craftlines. Added an “All” tab and a “Unit” tab to the Photon Color Changing menu. You can now change the photon colors of certain units. You can now trade in ten ★11 weapons to receive ten Excubes. The Badge & Memory exchange shop will feature a new category known as [Badge Exchange Shop 3]. This can be accessed by selecting [Exchange Weapons Badges 2015]. [Badge Exchange Shop 3] will list most of the items available from the [3rd Anniversary Exchange Shop]. 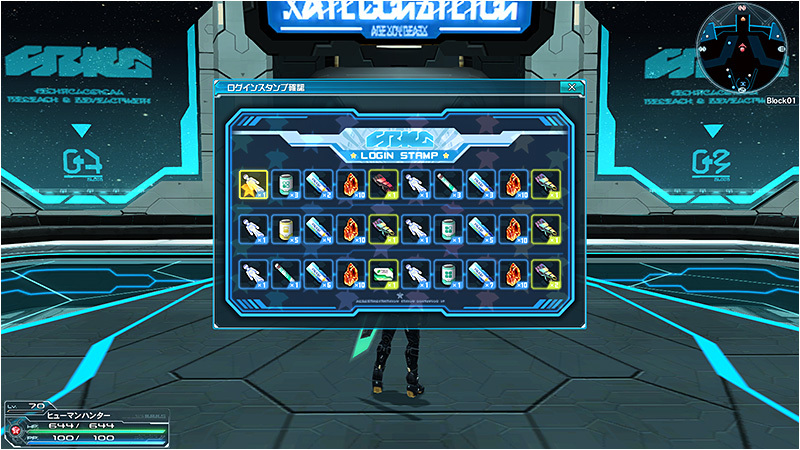 These items still require the 2015 Weapons Badges from the previous event. Ragol Memory Exchange Shop lineup has been updated. The CM Exchange Shop has a new menu listing for [Challenge Mile Exchange Shop 2]. This shop will contain Photon Boosters, Mag Evo. Devices, and Ideal Units. You can now trade in 10 Craftsman seal (職人の印) to receive 10 Lambda Grinders (ラムダグラインダー). Changed the Casino Prize Counter lineup. <getitem> or <gi> mentions the name of the most recent item you picked up. Made improvements to the Launcher reducing the time it takes to update the game. 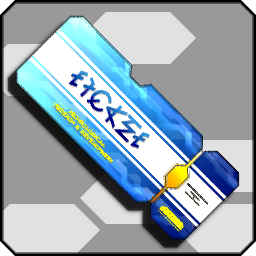 An animation and sound effect will play when a compound technic becomes available. The EQ “Oceanic Menace” will now drop the weapons [Lind Onett] and [Lind Storm] on Extra Hard. AC Scratch Items that qualify for the Recycle Shop will now be distinguishable from other items. Changed the icon designs of +50% and +100% Triboosters. Added “AC Scratch Items” to the list of item sorting. Master Craftsman Seal and Swordsmith Emblem can no longer be thrown away. [Rappy Slots] The chance of winning a jackpot will temporarily increase for ships with Jackpots at the 500,000 limit. The name of the Challenge Quest will now display in the mail for those who win a prize in the Challenge Rankings. It is now possible to select partners from the [Remove From Party] submenu in the Party Command menu. Time Attack Rankings have been split up to separate solo players from group players. Solo Time Attack Runs can also count towards Group Time Attack Rankings. Solo Time Attack Rankings will begin on August 31st in Japan. Results will be available on September 7th, 2015. Added a feature that allows you to use and purchase [Liliparium All (Max)] when a Craft Line is cooling down. Made changes to Timed Ability Installations to no longer select [Untekked Drop Rate Up] as a Main Effect. You can still use [Untekked Drop Rate Up] as a Main Effect if it was saved to the data drive. Ship transfers will now display the name of the ship you wish to transfer to within the final confirmation screen. Adjusted Advance Quests to reduce the HP of some enemies. 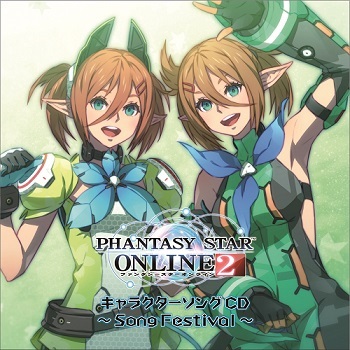 The PSO2 Character CD ~Song Festival~ II releases on August 26th! 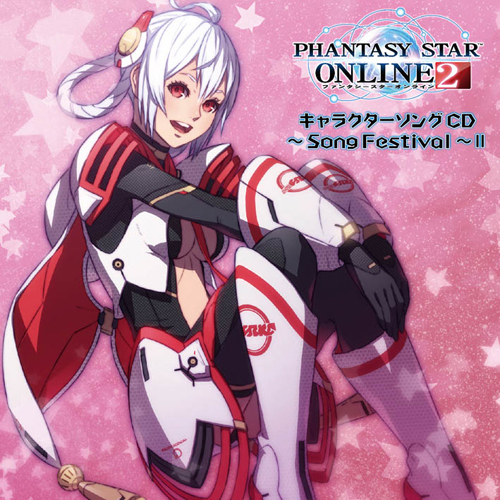 Six songs by characters like Matoi, Afin, and Theodore are featured, as well as a mini-drama track. 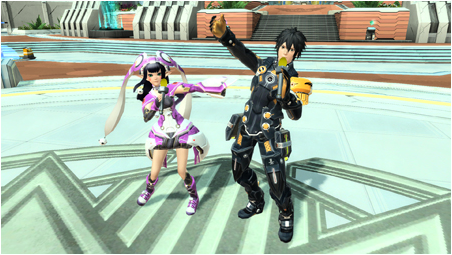 The CD also includes codes for bonus in-game items such as a singer lobby action and character voices. The musical stylings of Takenobu Mitsuyoshi and the PSO2 Live Broadcast crew are coming in soundtrack form on September 3rd! 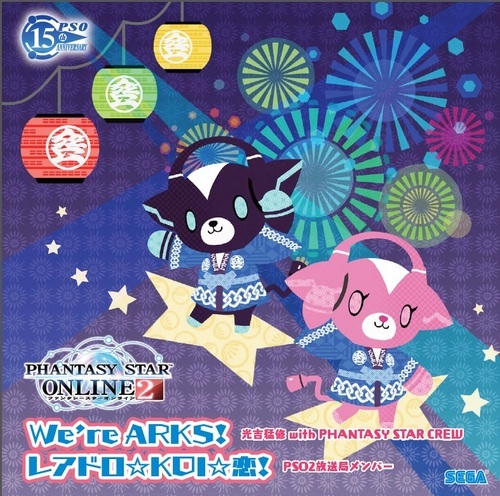 The CD features the two ARKS Dance Festival songs along with several variations of each. 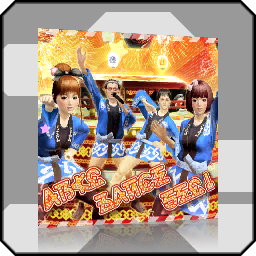 Item codes for music discs of both tracks and a room mat of the cover artwork are included as well. 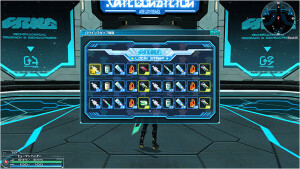 ※All of these items can already be found in the Player Shops on PSO2 from early purchasers who attended the ARKS Festival 2015! 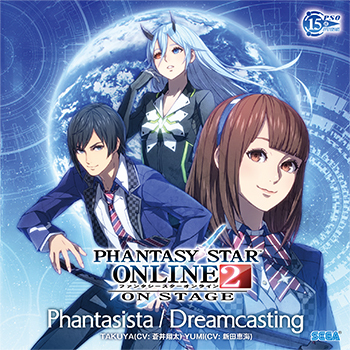 Players can receive item codes for music discs from the PSO2 ON-STAGE Phantasista / Dreamcasting CD or the original Character CD by purchasing songs from animelo mix on their Android & iPhones. The music disc you receive corresponds with the track you buy. If you buy the entire album, you’ll receive codes for all the songs included. Receive Ragol Memories and more based on the total amount of AC spent during the campaign period! Spend the last days of August clearing Revelle’s client orders to receive these wonderful prizes. My crystal balls tell me the only thing keeping that Raredrop music from selling like the proverbial hotcakes will be prices fit to give the Sultan of Brunei a case of the vapors. Rare Drop Koi sells for 30m on ship 2. Anyone can do a translation list of mag devices from Challenge Mile Exchange Shop 2? All mags devices have a R and how game dont have any preview is hard to figure out what is what there. I’ll add them to the Evo. Device page shortly, but they’re all the default evolutions. You can see them all here for now.